We use the industry's best computer generated voices to narrate your videos but admittedly they can't replace an actual human voice. Unfortunately, recording a voice-over using traditional software can be a tedious task, especially the part where you have to sync the voice with the video. 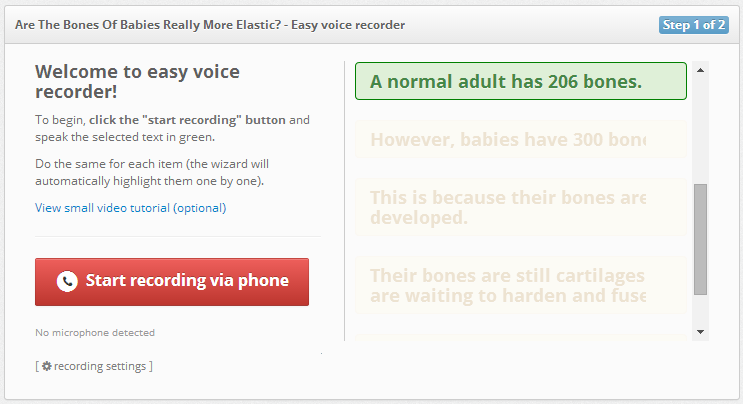 So after a lot of brainstorming, user feedback and a long development cycle we created a new voice-recording tool called the Easy Voice Recorder. But what's wrong with Windows Sound Recorder or Camtasia? When you use a sound recording program like Windows Sound Recorder, you have to record the audio separetly from the video and then later on sync the audio and video by hand. This can be extremely boring and time consuming to say the least. The other method is to load the video in a seperate window and try to record the audio while the video is playing. This too can be exteremely difficult and error prone. And finally, recording a long voice-over in one sitting is quite difficult as you are prone to make mistakes by mis-pronouncing words, losing sync, etc which can be very difficult to fix without re-recording the entire script again. Solution: Easy Voice Recorder - Add your own voice to your videos in 2 mins! Easy Voice Recorder makes recording your voice very easy for you because first of all there is no need to sync the audio and video by hand. EVR does this automatically for you because it knows the text which is being spoken by you. Secondly, EVR breaks up your entire video into small bite size pieces and prompts you to speak it line by line. What this means to you is that you don't have to speak the entire voice-over in one go. Not only does this reduce the chances of error, but this way even if there is an error in speaking a word, you don't have to record the entire script again (but only that single line). Finally, if you don't have a microphone hooked up to your computer you can still record your voice using your phone. Just call the number on your screen and start recording! Article Video Robot makes is easy for you to create a lot of videos quickly because video marketing is a numbers game. The more videos you create, the more keywords you can target, and the wider is your reach. But there are many other tools in the market that let you create videos in bulk too. The most common software being Microsoft Powerpoint using which you can create Slideshow videos to promote your products. So what sets Article Video Robot (AVR) apart? Article Video Robot can analyze any article and create the video script for you automatically. With any other software creating the script for your video can be very boring and time consuming.A lot people just get stuck at it because they don't what to say in their videos. 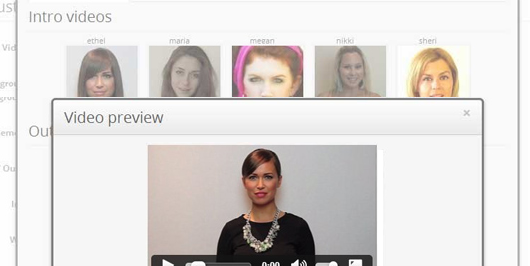 Secondly, how do you create engaging videos which generates free leads and traffic to your site? We have created dozens of video intros done by professional actors that we insert at the start of your video to make the viewer feel that a real human being has created your video and he/she is also the narrator. We use video templates like the Whiteboard animation, Search Theme and dozens of other themes to make your videos look professional and stylish thereby increasing viewer engagement. At the end of your video, we insert another Actor video that urges the viewer to "click the link in description". This is a very effective way to redirect the viewers from YouTube to your site. Innovative new features like Video in Video using which you insert related YouTube videos inside your video to make them highly interactive and engaging. This also makes the viewer feel that a lot of research has been done to create the video. Bonus tools like YouTube SEO Wizard to help your rank your videos on top of YouTube and Google search results. Video quality score with point with step-by-step suggestions for every video you make so you can optimize for increased viewer engagement. Bonus tool Video Submit Robot that distributes your video to dozen of video sharing sites like YouTube, Dailymotion, Metacafe, Facebook, etc so which incidentally also makes it easy for your video to make it into the Google search results. Bonus tool Social Submit Robot builds second tier links to your videos from 50 social and bookmarking sites like Reddit, AOL, Delicious, etc so that your videos start ranking instantly! Our current pricing for videos is $1 / video. Stop and think about it for a second because for just $1/video you get the full voice-over, animation, real actor videos, dozens of video styles, graphics, music, and free submission to top video sites and second tier links to your videos from 50 social and bookmarking sites. In addition to it, you get amazing software bonuses (not e-books) like the YouTube Optimization, Article to PPT Wizard, Easy Voice Recorder that have forever changed the way to do video marketing. But we've considered the many requests from members about discounts / option for a one-time payment (instead of monthly payments). I'm happy to announce that our 6th Anniversary is coming up this week and we will be celebrating 6 successful years of Article Video Robot by organizing a small Birthday sale. During this Sale we will give-away 20 business accounts at throwaway prices. Unfortunaly we can only offer a limited number of packages on this special occasion and the Sale will last for only 24 hours. So if the pricing is holding you back - make sure you don't miss out on this amazing deal (all members will be notified via email when this Sale starts).